– Implant: it is a metal, screw-like post (made of titanium) that is surgically placed in your jaw bone to replace the root of a missing tooth. Dental implant surgery is an alternative to bridge or denture that does not fit well. – Abutment: it is an extension of the post on the dental implant where the permanent crown will be placed. 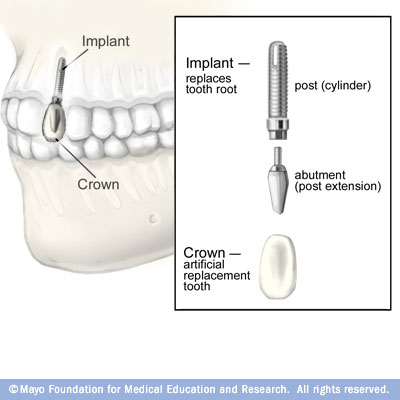 – Crown: it is an artificial tooth (laboratory processed) which is placed/cemented permanently on the abutment. How dental implant surgery is performed depends on the type of implant and the condition of the jaw bone. Most of the time patient will need a bone graft procedure before the implant surgery. All dental implant surgery requires several procedures and is done in stages. The whole process can take several months to complete due to healing periods in between the procedures. Like any surgery, implant surgery poses some health risks. Problems are rare, and when they do happen they are usually minor and easily treated. You can speak to your Dentist about all the risks involved before making any decision.